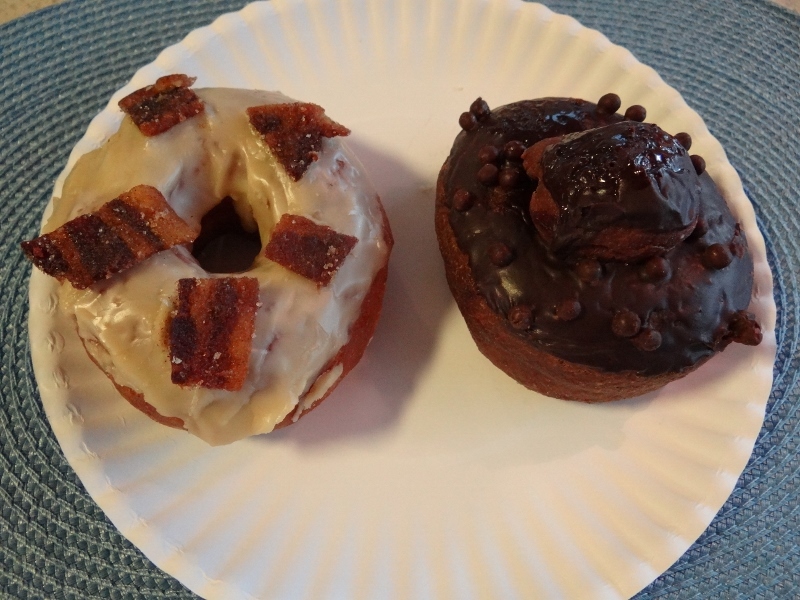 Some may recall that we are donut hunters, searching out the best local donuts to take us to donut heaven. The tiny bakery we’d seen on our first visit vanished and try as we might, even asking around, we couldn’t find the darn place. So much for Cronuts. But as we walked down Whitehead after visiting the Shipwreck Museum, toward our car and the Impossible Things Bead Emporium, on Eaton Street sat “Glazed Donuts”. If that name doesn’t spell it out for you then welcome Martians to Earth! With a look and feel lifted out of NYC tempered with Keys ambiance, the classy joint sat conveniently next to the Tropic Theater with a Marilyn Monroe statue on the sidewalk. Open 7am to 3pm, we just made it at 2:30. Ten to twelve standard offerings are individually displayed in clear cubbies on the counter to allow for pondering and drooling on yourself, not the donut. A metal bakery rack sits off to the side with fresh donuts. I got a glazed to go and we each chose one for the next morning. Oversized so you don’t feel too bad about paying $1.50 (others cost more!) the dough of the glazed donut reminded me of Britt’s slight egg-y flavor, but these were larger and not quite so close to a French cruller texture.